Damn Arbor: UFO sighting in Ann Arbor? UFO sighting in Ann Arbor? Sounds pretty serious. Gentle readers, did any of you see these strange red orbs? Were any of you abducted? Wow ! 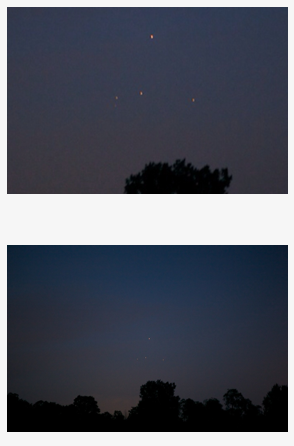 My wife and I saw these two red light tonight in the sky, around 10pm. They did not blink at all, and were sort of an orange-red, with one moving up fast on the other, then seemed to disappear. ? We were joking about it. Did'nt see much fireworks but saw a UFO, or two. They looked pretty far up in the sky. My wife first mistook them for red tower lights, but I said there are no towers around in that direction. That's when we saw they were moving at a fair clip through the sky. Trees prevented us following them, but then... no more. ? Looked very similar to this photo. Very curious. Just tonight, I was walking with my boyfriend around 10:40 pm when we saw the exact same thing as pictured above. There were about 4 or 5 red-orange glowing lights floating in a V-shape that eventually faded out one by one. They were just over the tree line off in the direction of 23 North. We were wondering if it's some meteorological testing or something with weather balloons. Last night at 11:11 pm I wanted to commemorate the day, as it only comes once, and as I approached the observatory in the nights' sky a fiery ember began to glow across the horizon. One by one, these celestial bodies traveled from a local origin to an exact destination; however, they followed along a similar trajectory but at different times which parallels with concepts of flight patterns. I've seen them before in the area, but this was the closest they had ever appeared. They don't seem to be ufo's but the way they move and glow would have me believe they are not of the ordinary, almost like how the media interprets a ghost. They can make any turns and can soar at amazing speeds. I'm no expert, but what I saw last night confirmed their existance and was quite wonderous to experience. I've seen them fly in uniform with several other witnesses just outside of Liberty Park. Right out in the open air in the metropolitan cityscape these orbs have been visiting and re-visiting our town, but why? I have noticed a corrolary variable that might hold some worth. Currently, in Ann Arbor's sky one can see a lightshow of beacon lights tied to buildings and cranes. There's alot of building going on and the large scale machinery is peppered with ominous blinking red lights. No idea what kind of pattern, but I wonder if the abundance is attracting the attention of others looking down from above. Hmmm. Just a thought. Keep your heads up and your eyes peeled!